Jazz-influenced pianist Willie Tee is a New Orleanians' New Orleans musician. He started recording with his brother Earl Turbinton for Harold Batiste's AFO Records in 1960 and by 1965 had scored a top twenty hit with the breezy, laid back "Teasin' You," followed by a string of similarly great uptown soul cuts on Nola Records. "Thank You, John," and especially the superb "Walking Up A One Way Street" never came near the chart position of "Teasin' You" but all became instant classics in the Carolinas where the Shag Scene had already taken off. 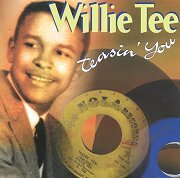 Now as popular as ever, Tee's songs rank alongside Beach Music favorites like Brenton Wood's "Gimme Little Sign," the Showmen's "It Will Stand" and Maurice Williams' "Stay." In the late sixties Tee launched a second career that just added another dimension to his already complex musical personality when he formed the Gaturs, a tough instrumental combo that specialized in self-produced psychedelic funk released all their material on their own label, Gatur Records. Sounding like Booker T.& the MGs facing off with a Mardi Gras Indian Tribe on deep funk classics like "Wasted" and "Gator Bait" and the Impressions or Archie Bell & the Drells on "First Taste Of Hurt" and "Funky, Funky Twist," the Gaturs not only provided the perfect soundtrack to the Crescent City, circa 1970, they released all their material on their own label, Gatur Records. The recent funk frenzy has catapulted the multi-faceted Tee to the forefront once again, where his work is considered second only to that of Eddie Bo in the realms of revolutionary New Orleans funk.